Audi India seems hell bent on starting an all out price war in the entry level luxury segment with the recently launched A3 sedan and the Audi Q3S petrol which has recently been caught testing on Indian roads. Audi seems quite keen on eating into the market share of the Mercedes-Benz A-Class, B-Class and the BMW 1-Series with the stripped out Q3S petrol which will join forces with the diesel Q3S and the Audi A3 soon. The Audi Q3S petrol is expected to cost around Rs. 24 Lakh (ex-showroom) which will be around 6 Lakh cheaper than the standard petrol Q3. Much like it’s diesel counterpart, the Audi Q3S TFSI will ditch features like projector headlamps, LED daytime running lights and will be replaced with conventional halogen bulbs. 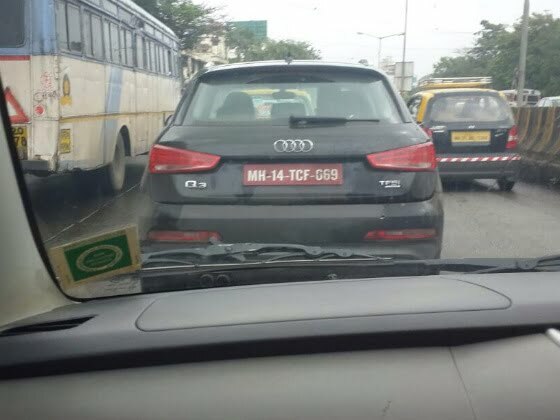 Even the tail lamps will miss out on Audi’s trademark LED treatment. Other changes include 16-inch alloys instead of 17s, all black interiors as compared to the standard model’s black and beige treatment. Expect features similar to the ones seen on the diesel Q3S along with blacked out exhaust tips and the exclusive red paint shade aimed at a younger audience. A 2.0 litre TFSI petrol engine producing 208 BHP and 300 Nm torque is likely to power the Audi Q3S petrol possibly in a lower state of tune mated to a 6-speed manual transmission. Also, the all wheel drive Quattro system is likely to be ditched for a cheaper front wheel drive layout. The Audi Q3S petrol will most likely be available in Indian showrooms by Diwali but we haven’t received any official confirmation yet. The crossover will go up against the Mercedes A-Class and B-Class and BMW’s 1-Series and X1.